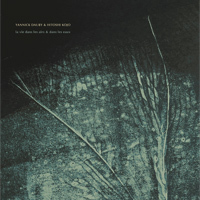 Drone Records is proud to present the first ever collaboration release of these two cosmopolitan sound artists from France and Japan (residing currently in Taiwan and Belgium), based on a variety of field recordings, ‘concrete’ material improvisations and personal additions done in different parts of the world. We can hear mysterious (micro)-sounds that could come from minerals, stones, plants, or daily objects and instruments – opening up two soundscaping tracks full of wondrous elements, combining the ‘concrete’ with the sublime and the atmospheric…. lost in the huge network of organic entities in the ‘More-Than-Human World’ around us.